Stereophonics, James Bay and Guy Garvey are also set to play the five-night event. Catfish And The Bottlemen have announced their first headline date for 2016. The Welsh band will play Manchester's Castlefield Bowl in July, which will be their biggest solo show to date. Posting the news to their Instagram page, the band said "We’re pleased to announce our biggest headline show to date…. Friday night - July 8th, 2016 - Outside in the open-air at The Castlefield Bowl!" "We’ll see you all there all full of 2nd album and some throwbacks to the eldies from them Balcony days." Catfish will close the event on Friday 8 July 2016, which plays host to five nights of live music. Guy Garvey kicks off the string of gigs with his homecoming headline slot on Friday 1 July. 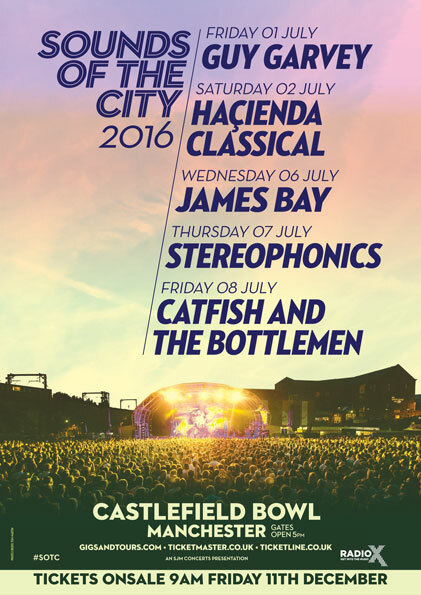 Other acts set to top the bill are Hacienda Classical, James Bay and Stereophonics. Tickets go on sale at 9am on Friday 11 December.